USCIS recently unveiled a new look to its website and additional features such as a better Case Status tool and user-friendly E-Request tool. The Case Status tool now includes more information on case histories, next steps, and in certain instances, United States Postal Service tracking numbers for cards or documents that are generated and mailed. You will need your USCIS-issued receipt number to access and track your case progress with the tool. 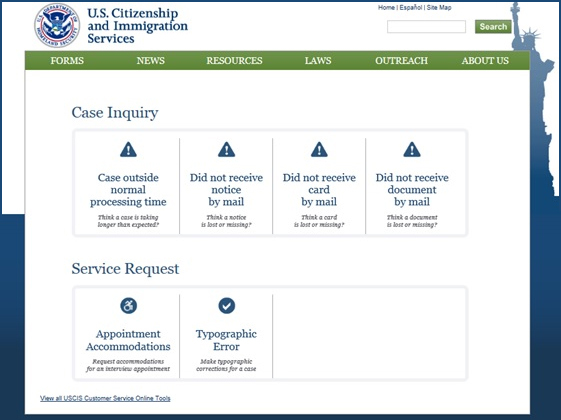 You can access the Case Status tool on your smart phone and at the following website: https://egov.uscis.gov/casestatus/landing.do. Submit a case inquiry if you have a case pending with USCIS that you believe is outside the normal processing time posted on the USCIS website. To send this inquiry you will need to access the website, click on the correct tab, and submit your receipt number, A-Number (if applicable), date filed, and the type of application or petition filed. Submit a case inquiry if you did not receive a notice by mail (such as a receipt notice, request for evidence notice, or decision notice). For example, if you check your case status using the Case Status tool, and the case status states that a notice was issued and you have not received that notice, you can submit a case inquiry regarding the lost or missing notice. Note that you should not submit an inquiry if you recently filed an application. USCIS issues receipt notices within 30 days of receiving your application. To send this inquiry you will need to access the website, click on the correct tab, and submit your receipt number, A-Number (if applicable), date filed, the type of application or petition filed, and item not received. Submit a case inquiry if you have a filed a case with USCIS and you have not received a card or document that was mailed. For example, when USCIS grants a benefit a new or replacement card or document is generated and mailed. Sometimes these cards or documents are not processed or delivered. Note that USCIS takes approximately 30 days to issue and mail the card or document. To send this inquiry you will need to access the website, click on the correct tab, and submit your receipt number, A-Number (if applicable), date filed, the type of application or petition filed, and item not received. Submit a service request if you need an accommodation due to a disability that prevents you from attending a scheduled USCIS appointment, program or activity (such as interview appointment, naturalization ceremony, ASC appointment, or InfoPass appointment). To send this request you will need to access the website, click on the correct tab, and submit your receipt number, A-Number (if applicable), appointment notice, and date and location of USCIS event or program. Submit a service request if you have a typographic/spelling error on a notice, document or card from USCIS. To send this request you will need to access the website, click on the correct tab, and submit your receipt number, A-Number (if applicable), date filed, and item that contains the error. To learn more about all of the new and improved tools you can visit the USCIS customer tools website at www.uscis.gov/tools.